Reach out. Roll balls. That was the tag line for my New Year’s resolution in 2015. I had slipped into a terrible habit of not proactively reaching out to friends and getting the ball rolling on plans. I was either the recipient of an invitation where I joined in the fun, or text strings would end with, “Yes! We should definitely get together soon!” and nothing further would transpire. I have a handful of friends in my life that are so good at activating plans. To the point that sometimes I seriously wonder if they have a calendar reminder set for one friend a week so that everyone gets attention on a semi-regular basis. I go in fits and spurts on igniting plans with people. It’s not for lack of interest in being social – it’s just that at times, my luke warm interest in the phone paired with my habit of getting distracted by just about everything makes it difficult for me to sit down and follow through. I realized this a few days ago when I had lunch with a good friend who I hadn’t seen in more than a month. We used to see each other on nearly a weekly basis, but since my life got upended with our move and my new job, I haven’t been as good about reaching out. In our dynamic, my role was the organizer and the one who would make the plan and execute our hanging out. With my bandwidth a bit compromised these days, I have been rather quiet and distant. I need gathered. This was a concept that my boss introduced to me and I love it. Some people are the gatherers and some people need gathered. She is one who needs permanently gathered. If you want to see her, make the plan and tell her when and where to show up. Don’t take it personally if she’s not the one having the party or reaching out and making the plans. For me, I’m better at doing the gathering, but I’m in a temporary state of needing gathered by others. It’s like I’ve raised a white flag of surrender above my house to let people know that if they would like to see me, I need you to come gather me. The flag will come down soon, but until then, I’m grateful to all of my friends who are barging into my life and willing to reach out and roll balls. 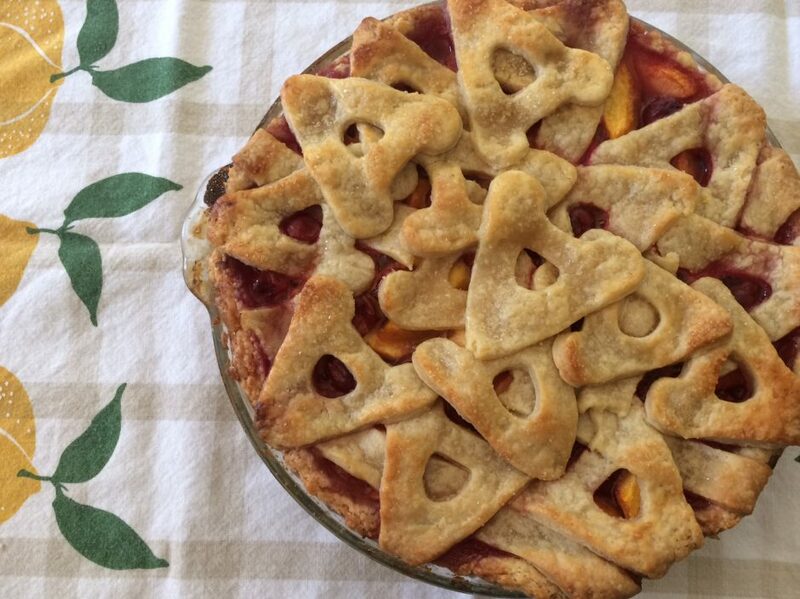 I would be doing you a disservice if I let peach season pass without telling you to make this pie combination. It’s my absolute summer favorite. I’ve posted the pie-in-a-jar recipe for this combo, but have yet to post the whole pie! If you come upon some peaches, give this a shot! Prepare crust from your recipe of choice and let chill in refrigerator for at least an hour or overnight. Tip: When separating your dough into two rounds, use the one that seems heavier/larger for the bottom crust and the other one to make your top crust. I pull just a little more dough into the one for the bottom crust. When chilled, plate the dough in a deep dish pie plate, leaving the edges untucked. 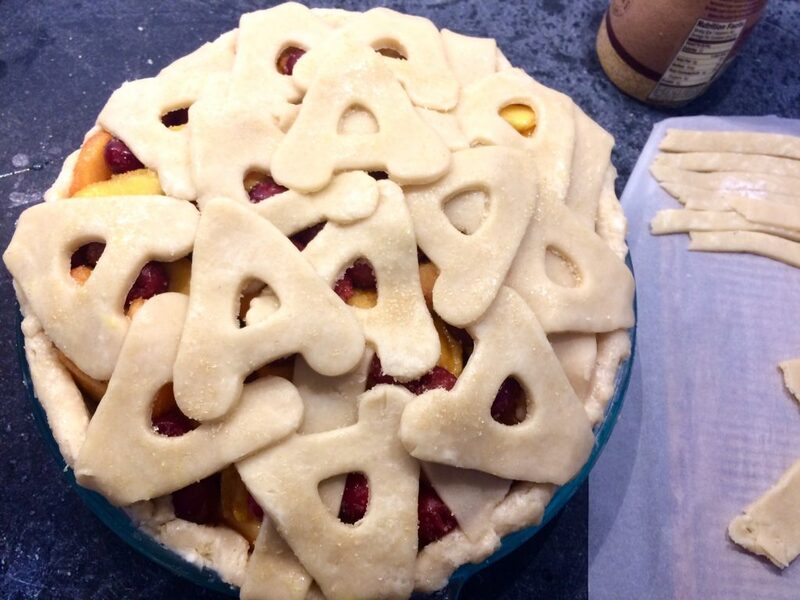 Take the top crust and prepare a lattice or other decorative top crust. You can place the strips or pieces on a baking sheet and leave everything in the refrigerator to chill while you put together the filling. Prepare your peaches by bringing a pot of water to a boil. Before putting the peaches in, prepare an ice bath in a large bowl. Place the peaches in the boiling water for about 20 seconds, until the skin starts to split. Remove peaches and place directly into the ice bath to stop the cooking process. Pat dry and peel off the skins. 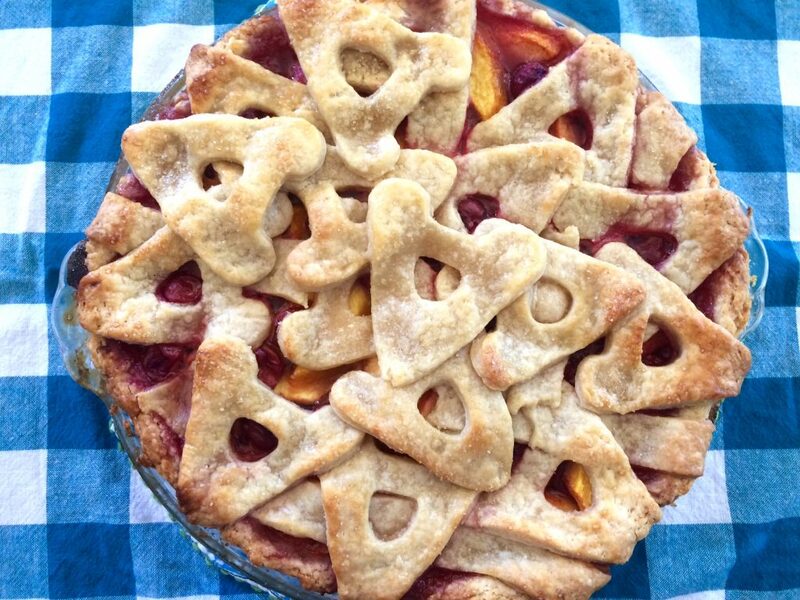 Slice peaches into 1/2 inch thick slices and place in a large bowl with the cherries. Add 1/3 cup sugar, lemon juice and vanilla. In a small bowl or ramekin, mix 2 tablespoons of sugar, the cornstarch, cardamom and cinnamon together. 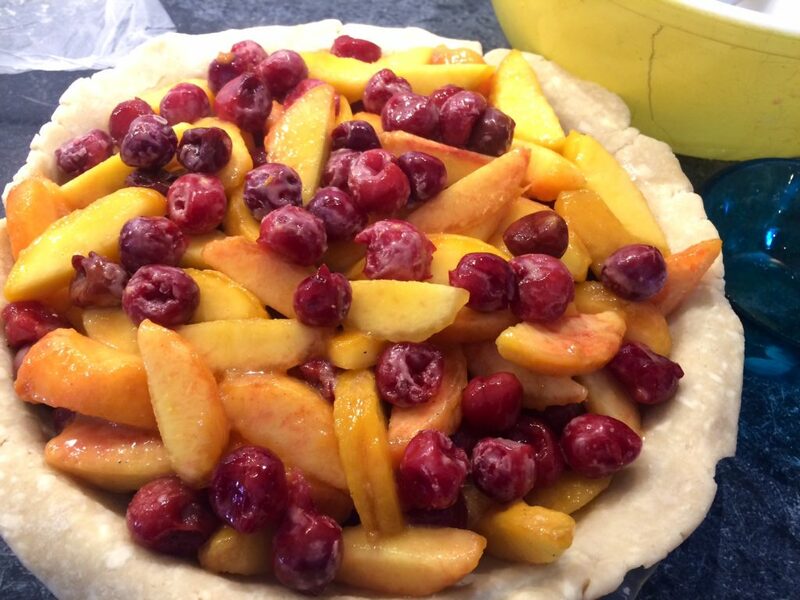 Gently incorporate the cornstarch mixture into the fruit and place in chilled pie crust. Place desired top crust, lightly brush with an egg wash and sprinkle with turbinado sugar. Bake at 425 for 20 minutes, the lower heat to 375 and bake for another 20-30 minutes until brown and juices are bubbling. 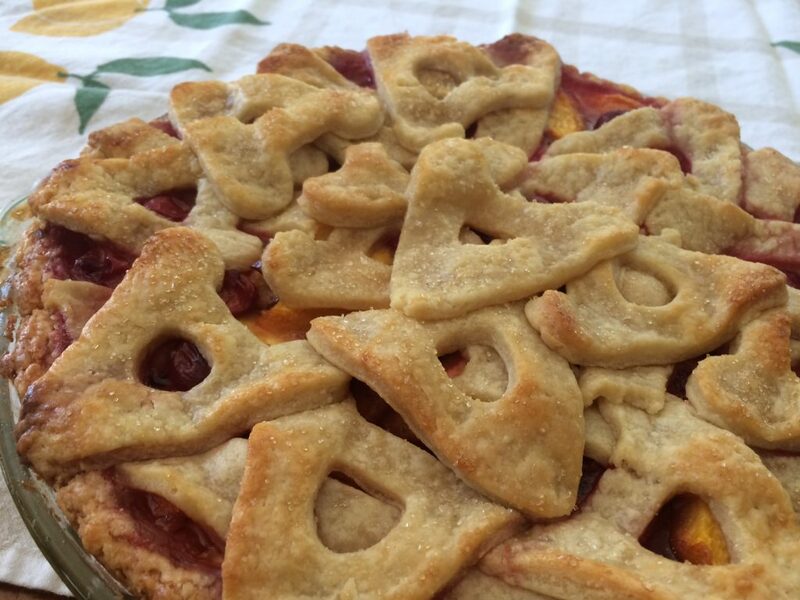 4 thoughts on "Peach Sour Cherry Pie"
I waited for Jay to enjoy this Addison pie and it was worth the slight wait. It was incredible. A great balance of sweet and tart! She may have been put into a food/pie coma too since I got almost 5 hours of straight sleep from her! Thank you again and I highly recommend people trying this recipe at home. I have fresh blueberries which I would like to use instead of cherries. Any thoughts if there are any changes to the recipe you’d recommend? Thanks for your expert advice!